Notice for enrollment fee and other fee for session 2018-19. Circular Regarding to Form 16. 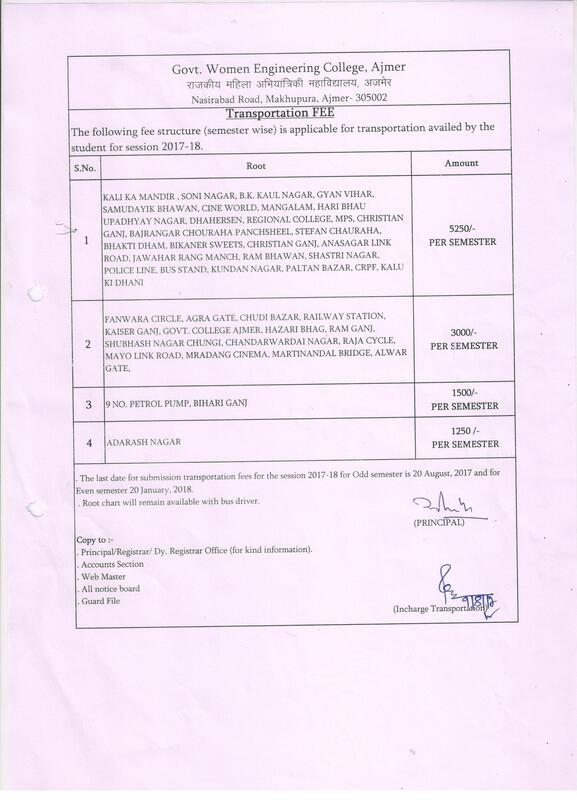 Order Regarding to Fee Determination. Notice for transportation fee session 2017-2018. Steps for Deposit college fee in college account using SBI site. Attendance of 31 Jan 2019. Attendance of 30 Jan 2019. Attendance of 29 Jan 2019. Attendance of 24 Jan 2019. Attendance of 23 Jan 2019. Attendance of 22 Jan 2019. Attendance of 21 Jan 2019. Attendance of 19 Jan 2019. Attendance of 18 Jan 2019. Attendance of 17 Jan 2019. Attendance of 16 Jan 2019. Attendance of 15 Jan 2019. Attendance of 14 Jan 2019. Attendance of 11 Jan 2019. Attendance of 10 Jan 2019. Attendance of 09 Jan 2019. Attendance of 08 Jan 2019. Attendance of 07 Jan 2019. Attendance of 05 Jan 2019. Attendance of 04 Jan 2019. Attendance of 03 Jan 2019. Attendance of 02 Jan 2019. Attendance of 24 Dec To 31 Dec 2018. Attendance of 22 Dec 2018. Attendance of 21 Dec 2018. Attendance of 20 Dec 2018. Attendance of 19 Dec 2018. Attendance of 18 Dec 2018. Attendance of 17 Dec 2018. Attendance of 15 Dec 2018. Attendance of 14 Dec 2018. Attendance of 13 Dec 2018. Attendance of 12 Dec 2018. Attendance of 10 Dec 2018. Attendance of 5 Dec 2018. Attendance of 4 Dec 2018. Attendance of 3 Dec 2018. Attendance of 30 nov 2018. Attendance of 29 nov 2018. Attendance of 28 nov 2018. Attendance of 27 nov 2018. Attendance of 26 nov 2018. Attendance of 24 nov 2018. Attendance of 20 nov 2018. Attendance of 19 nov 2018. Attendance of 17 nov 2018. Attendance of 16 nov 2018. Attendance of 15 nov 2018. Attendance of 14 nov 2018. Attendance of 13 nov 2018. Attendance of 12 nov 2018. Attendance of 6 nov 2018. Attendance of 5 nov 2018. Attendance of 3 nov 2018. Attendance of 2 nov 2018. Attendance of 1 nov 2018. Attendance of 31 Oct 2018. Attendance of 30 Oct 2018. Attendance of 29 Oct 2018. Attendance of 27 Oct 2018. Attendance of 26 Oct 2018. Attendance of 25 Oct 2018. Attendance of 24 Oct 2018. Attendance of 22 Oct 2018. Attendance of 20 Oct 2018. Attendance of 18 Oct 2018. Attendance of 16 Oct 2018. Attendance of 15 Oct 2018. Attendance of 12 Oct 2018. Attendance of 11 Oct 2018. Attendance of 9 Oct 2018. Attendance of 8 Oct 2018. Attendance of 6 Oct 2018. Attendance of 5 Oct 2018. Attendance of 4 Oct 2018. Attendance of 3 Oct 2018. Attendance of 1 and 2 Oct 2018. Attendance of 28 sep 2018. Attendance of 27 sep 2018. Attendance of 26 sep 2018. Attendance of 25 sep 2018. Attendance of 24 sep 2018. Attendance of 22 sep 2018. Attendance of 20 sep 2018. Attendance of 18 sep 2018. Attendance of 17 sep 2018. Attendance of 15 sep 2018. Attendance of 4 sep to 7 sep 2018. Attendance of 1 sep 2018. Attendance of 25 Aug to 31 Aug 2018. Attendance of 26 July to 25 Aug 2018. Attendance of 26 July to 28 July 2018. Attendance of 26 Jun to 25 July 2018. Attendance of 20 july 2018. Attendance of 12 July to 19 july 2018. Attendance of 26 Jun to 9 July 2018. Attendance of 26 May to 25 Jun 2018. Attendance of 29 & 30 May 2018. Attendance of 26 april to 25 May 2018. Attendance of 4 may 2018. Attendance of 28 april 2018. Attendance of 27 april 2018. Attendance of 26 march to 25 april 2018. Attendance of 24 april 2018. Attendance of 21 april 2018. Attendance of 16 to 20 april 2018. Attendance of 13 april 2018. Attendance of 12 april 2018. Attendance of 11 april 2018. Attendance of 10 april 2018. Attendance of 9 april 2018. Attendance of 7 april 2018. Attendance of 6 april 2018. Attendance of 5 april 2018. Attendance of 4 april 2018. Attendance of 3 april 2018. Attendance of 2 april 2018. Attendance of 31 March 2018. Attendance of 26 to 28 March 2018. Attendance of 26 feb to 25 March 2018. Attendance of 24 March 2018. Attendance of 22 March 2018. Attendance of 21 March 2018. Attendance of 20 March 2018. Attendance of 17 March 2018. Attendance of 16 March 2018. Attendance of 15 March 2018. Attendance of 14 March 2018. Attendance of 13 March 2018. Attendance of 12 March 2018. Attendance of 09 March 2018. Attendance of 08 March 2018. Attendance of 07 March 2018. Attendance of 06 March 2018. Attendance of 05 March 2018. Attendance of 04 March 2018. Attendance of 28 Feb 2018. Attendance of 27 Feb 2018. Attendance of 26 Feb 2018. Attendance of 26 jan to 25 Feb 2018. Attendance of 24 Feb 2018. Attendance of 23 Feb 2018. Attendance of 22 Feb 2018. Attendance of 21 Feb 2018. Attendance of 20 Feb 2018. Attendance of 19 Feb 2018. Attendance of 17 Feb 2018. Attendance of 16 Feb 2018. Attendance of 15 Feb 2018. Attendance of 14 Feb 2018. Attendance of 12 Feb 2018. Attendance of 9 Feb 2018. Attendance of 8 Feb 2018. Attendance of 7 Feb 2018. Attendance of 5 & 6 Feb 2018. Attendance of 3 Feb 2018. Attendance of 2 Feb 2018. Attendance of 31 Jan 2018. Attendance of 30 Jan 2018. Attendance of 27 Jan 2018. Attendance of 26 Jan 2018. Attendance of 26 dec to 25 Jan 2018. Attendance of 25 Jan 2018. Attendance of 24 Jan 2018. Attendance of 23 Jan 2018. Attendance of 22 Jan 2018. Attendance of 20 Jan 2018. Attendance of 19 Jan 2018. Attendance of 18 Jan 2018. Attendance of 17 Jan 2018. Attendance of 16 Jan 2018. Attendance of 15 Jan 2018. Attendance of 11 Jan 2018. Attendance of 9 Jan 2018. Attendance of 8 Jan 2018. Attendance of 5 Jan 2018. Attendance of 4 Jan 2018. Attendance of 2 & 3 Jan 2018. Attendance of 28 Dec. to 30 Dec 2017. Attendance of 26 Nov to 25 Dec. 2017. Attendance of 8 Dec. 2017. Attendance of 7 Dec. 2017. Attendance of 6 Dec. 2017. Attendance of 5 Dec. 2017. Attendance of 4 Dec. 2017. Attendance of 1 Dec. 2017. Attendance of 26 Nov to 30 Nov 2017. Attendance of 26 Oct to 25 Nov 2017. Attendance of 13 to 23 Nov 2017. Attendance of 9 Nov 2017. Attendance of 8 Nov 2017. Attendance of 7 Nov 2017. Attendance of 6 Nov 2017. Attendance of 2 Nov 2017. Attendance of 31 Oct. & 1 Nov 2017. Attendance of 30 Oct. 2017. Attendance of 28 Oct. 2017. Attendance of 26 & 27 Oct. 2017. Attendance of 26 sep to 25 Oct. 2017. Attendance of 23 Oct. 2017. Attendance of 17 Oct. 2017. Attendance of 14 to 16 Oct. 2017. Attendance of 10 to 13 Oct. 2017. Attendance of 9 Oct. 2017. Attendance of 7 Oct. 2017. Attendance of 4 & 6 Oct. 2017. Attendance of 2 & 3 Oct. 2017. Attendance of 26 to 27 Sept. 2017. Academic Calender for Odd semester session 2017-2018.